Hey, guess what? I shoot Pentax! Weird, I know?! I don't think twice about it, of course, but every now and then I get asked why I chose Pentax as my camera system, usually by an observant wedding guest with an interest in photography, and almost always when I'm darting around grabbing shots, with no time to spare for explanations. Well, it's mid winter now, and I'm buried in my office, with time to finally answer that question for you! So why did I choose Pentax, when so many photographers have gone down the Canon or Nikon path? Well, technically, Pentax chose me, when I joined my high school photography club and was handed one of the dozens of Pentax K1000's that the school loaned out to students on weekends, with a roll of film and a few vague instructions on how to use it. My fate was then sealed in Year 11, when my parents returned from Bali with a K1000 they'd purchased for me Duty Free (thanks Mum and Dad!). A couple of decades down the track, and I'm still shooting with that K1000, as well as Pentax's latest full-frame DSLR, the Pentax K1 (both pictured below). And the reason I've stayed with this system is because Pentax make superb cameras and lenses. They've been around forever, and have stood the test of time. Their optics are incredible - they even make a medium format camera, the Pentax 645 Z, which just goes to show the level of build quality they are capable of. They also boast a huge range of lenses, with many of the old manual film lenses being compatible with current digital cameras. 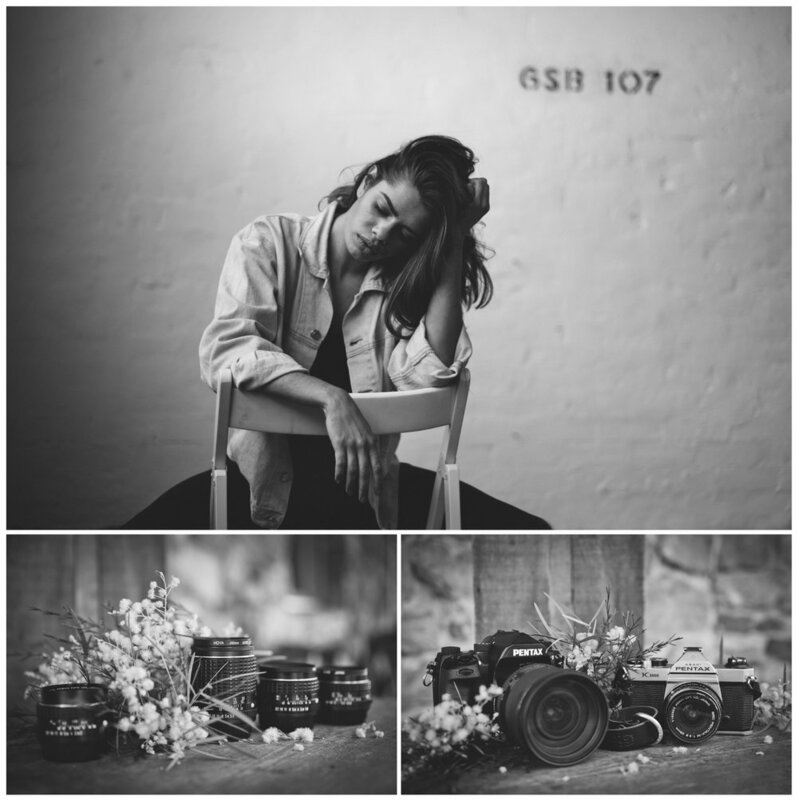 Which is a huge plus for me, because after so many years shooting Pentax, I now have a fabulous set of fast primes I can still use to create beautiful, dreamy images on your wedding day! And lastly, Pentax renders the final image with a lovely film-like quality, which goes hand in hand with my style, allowing me to produce images that hark back to the days of film, even when they're shot on the latest digital cameras. So really, what more could I ask for in a camera system?! Definately Pentax and proud! 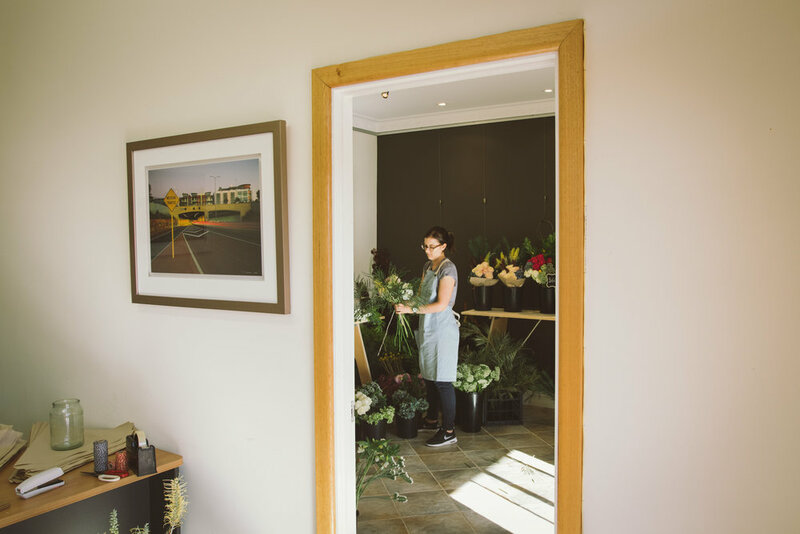 I recently spent a delightful evening with florist Sarah, from Petallica Flower Co here in the Avon Valley, shooting her beautiful blooms as she assembled them for Valentines Day. Working from a Pop Up Shop at her dads steel fabrication business in the industrial end of town, these little bunches of prettiness proved to be very popular, selling out quickly to scores of loved up locals on Sunday morning! But before they were snatched up and taken to their new homes, I got to spend time photographing them with our beautiful model, and friend of Sarah's, Jenna. All images were shot on my Pentax camera system, and processed to create a lovely moody look and feel for the end product. And all were shot within walking distance of the shop, literally just across the road, on the grounds of the old town bakery, and the vacant block next door, and in front of one very cute little white picket fence! Yep, we are indeed spoilt for shoot locations and backdrops out here!